As the year comes to an end, Urban Stories explores the emerging trends, key decisions and major changes on the horizon for cities around the world in 2017. With a new installment each day from India, Brazil and Washington, D.C., our series will provide an insightful overview of what’s happening in cities globally. 2016 will go down in history as a year of unexpected outcomes, including Brexit, Donald Trump’s election and presidential impeachments in South Korea and Brazil. In cities, the way residents commute started an unprecedented change with the rise of on-demand transportation services, like Uber and Cabify, followed by merges between Original Engine Manufacturers (OEM) and innovative technology companies. But this new mobility based on private vehicles is not going to extinguish the necessity for high-quality sustainable public transportation (and the challenges of financing it), safer streets designed for people and meeting climate commitments. WRI Brasil Sustainable Cities established an important partnership this year with FNP (National Association of Mayors) that will accelerate the scaling up of our work in the year ahead. This partnership will leverage our capacity to disseminate knowledge and replicate successful projects. On January 1, 2017, newly elected mayors will take office in more than 5,500 cities, home to more than 200 million people. The new city administrations will provide a fresh start, at the local level, for a four-year cycle of city transformation. In Brazil, the vision of mayors is key to determining the development path of a city, since they are politically empowered to invest in infrastructure. The federal government recently reshaped its financing strategy; it is now focused on Public-Private Partnerships (PPPs) and in tune with the New Urban Agenda, the document that came out of Habitat III in Quito, Ecuador. As a result, Brazil’s new mayors will face the challenge of advancing PPPs, instead of counting on loans for implementing infrastructure projects. To access new opportunities, Brazilian cities need to improve their capacity to develop bankable projects that are sustainable. Traditionally, mayors seek access to non-refundable assets from the federal or state governments or try to contract loans from multilateral or Brazilian development banks. There is a current lack of knowledge regarding the use of alternative financing mechanisms, including green financing, which open new and important perspectives for urban mobility projects. WRI Brasil Sustainable Cities urges new city administrations to engage with sustainable and smart urban principles. Mayors will have to establish a long-term vision for new infrastructure projects that need to be economically and environmentally sustainable to attract private partners and access green financing. We will support municipalities to improve new urban projects and heighten their capacity to do so. Brazilian Cities are late to the game in adopting new technological innovations and exploring the potential benefits of a data revolution. Existing regulations need to be adapted to account for the rapid growth of disruptive technology that is impacting many services, especially urban mobility. Brazil has been lacking visionary mayors that can drive a transformation toward a contemporary model of the city—one that replaces last century’s car-centric culture. Implementing projects for cyclists and pedestrians, with a focus on road safety and elevating the quality of public transportation, is critical not only for mobility but also for public health. Residents are taking on a more empowered role in the decision-making process, to ensure that new mayoral agendas reflect the true needs of the cities; people want their cities to be smarter. It is important to engage city staff, designers and consultants all over Brazil. Infrastructure projects in the country are lagging far behind the state of the practice in cities around the world. Working closely with the Ministry of Cities, WRI Brasil Sustainable Cities has identified knowledge gaps that are now being addressed by guidelines and criteria, such as the Seven Steps – How to Build an Urban Mobility Plan and the set of criteria for designing smart and people-friendly urban mobility infrastructure. New city administrations have to be engaged with sustainable and smart urban principles to mitigate emissions and adapt urban areas. The conversation around clean energy needs to become more present in Brazil, from the electrification of vehicles to the efficiency of buildings and public infrastructure. We believe that city dwellers are going to be the catalyst toward a zero-carbon reality, since 85 percent of Brazilians live in cities. In addition to cities, metropolitan regions will play a key role in new Brazilian development. 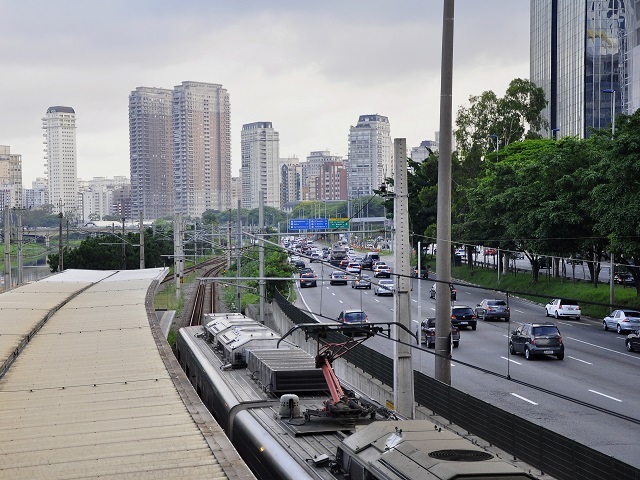 The recent law that requires each metropolitan area in Brazil to create a development plan by January 2018 established the opportunity to advance mobility and sustainable development beyond the limits of a particular city. Metropolitan areas host around 45 percent of the Brazilian population. As a result, embedding long-term, climate-smart policies into development plans can lay the foundation for a zero-carbon future. Increasing expert and civilian awareness and engagement on these issues can make governments, on all levels, react. According to Pew Research Center’s Spring 2015 survey, 90 percent of Brazilians say climate change is harming people now. If Brazil is to become an innovative country in Latin America for climate-smart development, individual behaviors, laws and practices must change. Technology can make cities climate-friendly by improving public services that impact public health, social equity, road safety, urban mobility and the economy. It’s time for climate change to be on the agenda for every decision in the public and private sectors. In 2017, WRI Brasil Sustainable Cities will focus on scaling up the work it has been successfully deploying at the city and national level since 2005. We will capitalize on opportunities created from the new mayors’ agendas, a solid relationship with the Ministry of Cities and the recent partnership with FNP. Brazil is one of the world’s main players in climate discussions and had a leadership role in Quito, working to include the “right to the city” in the New Urban Agenda. Now is the time to bridge the gap between discourse and action.